Everything especially the location. Dining, beaches and easy access to everthing. Well kept, clean and updated. Everything was perfect. Great staff, great location, and great room. Evangelia at the front desk was a lovely person with a great smile and guided us to the best beaches to visit. The pool was warm with excellent service. There were many restaurants and supermarkets just few steps away. Beautiful small hotel near the beach. Pool area gorgeous. sun bed 5-10 euros. on the beach a sun bed free. Friendly staff- I recommend! The best location! The hotel was way better than we imagined from the pictures. Right on the beach and in the middle of everything, bars tavernas restaurants and yet still very quite in the evening and night. We had a perfect 1 room apartment with enough space to feel at home. 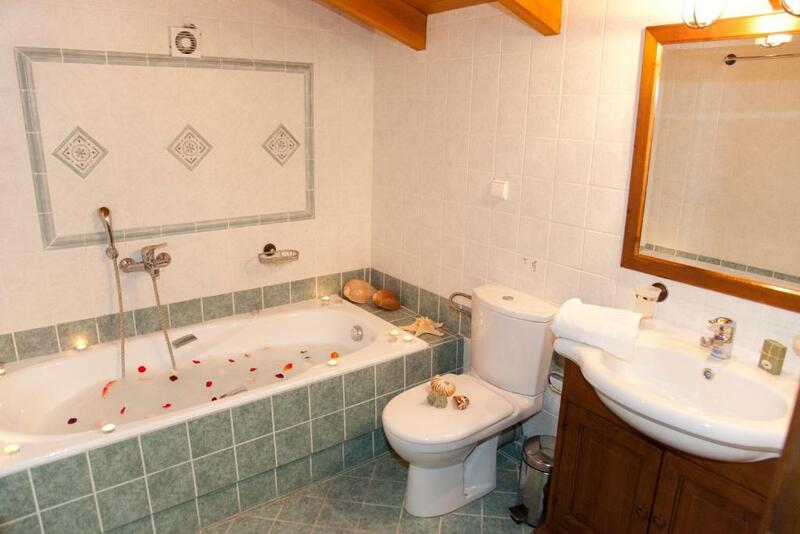 The cleaning was done almost daily and both the linning and the towels was changed again and again. Even though our apartment didn't have a direct see view we had the most fantastic view to the beachbar and the waves :-) The receptionist Eva was extremely helpful with everything from arranging a taxi to pick us up when we arrived - booking a car - suggesting thing to se and finding a doctor when needed. if it wasn't because we have a rule saying we can't go the same place twice we would definitely come back! *** EVERYTHING**** Now 4 years in a row now we have stayed at the Mylos Hotel Apartments. Everything from Jacob the taxi driver to Eva at the front desk everyone is so nice and do everything they can to make you're stay as relaxing as possible. We like it so much as we were checking out we paid the deposit for next year! We had the Penthouse- lovely big room. Clean sheets and towels every second day. Actually everything was perfect. The beach, shops, transport, etc. was close. And Eva was a very nice receptionist who helped us with allot. 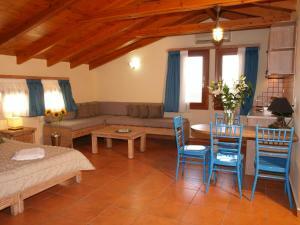 I would recommend to order trips to elafonissi, balos and gramvousa through the hotel. Would also take a trip to Chania with the local bus for a good price. The beds are comfortable, and they were good cleaning. The rooms are actually quite big, and the pictures on the sites doesn`t reflect the wellness of this hotel. They have a restaurant with pool next to the hotel with good food but a little bit expensive prices. This restaurant isn`t a place to bring a family with kids, but is perfect for couple and friends. Lock in a great price for Mylos Hotel Apartments (Adult-Only +16 years) – rated 9.2 by recent guests! One of our best sellers in Platanias! 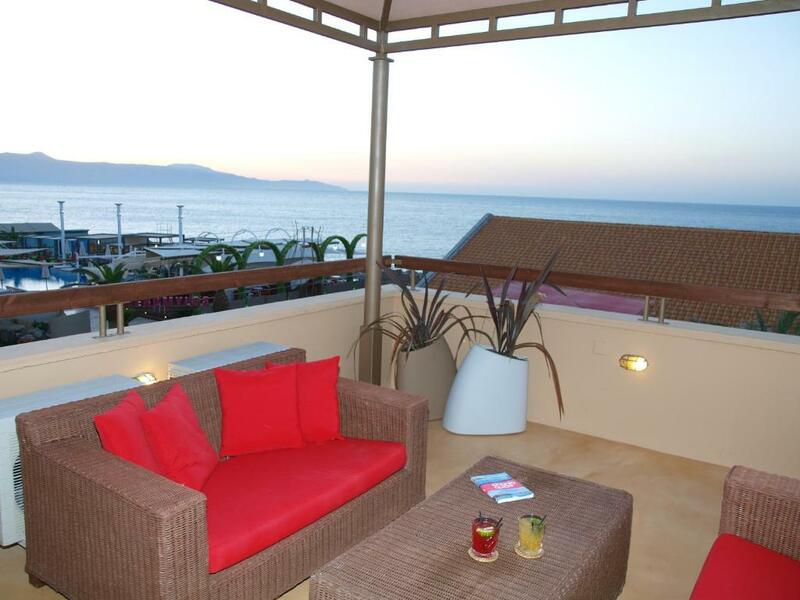 Mylos Hotel Apartments is located in Platanias, steps away from the center, and next to Mylos Night Club and Nemylos Beach Bar. It offers self-catering, adult-only accommodations. 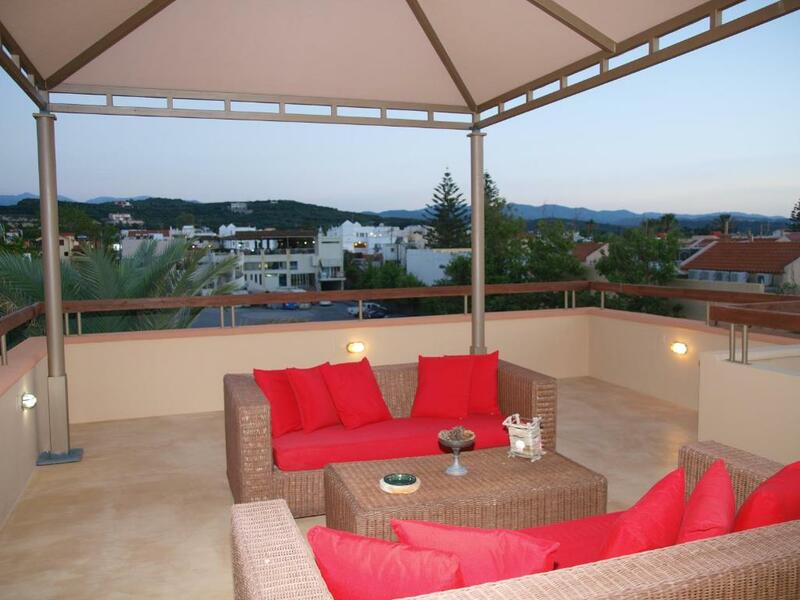 Mylos Apartments are airy and air conditioned. Each has a seating area with sofa, and a bathroom with tub. Kitchenettes come complete with cooker, fridge and kitchenware. Guests of the hotel are free to use the neighboring swimming pool of Neromylos Beach Bar, which also serves breakfast, meals and cocktails. Sunbeds are available at an extra fee. Free on-site parking is provided. 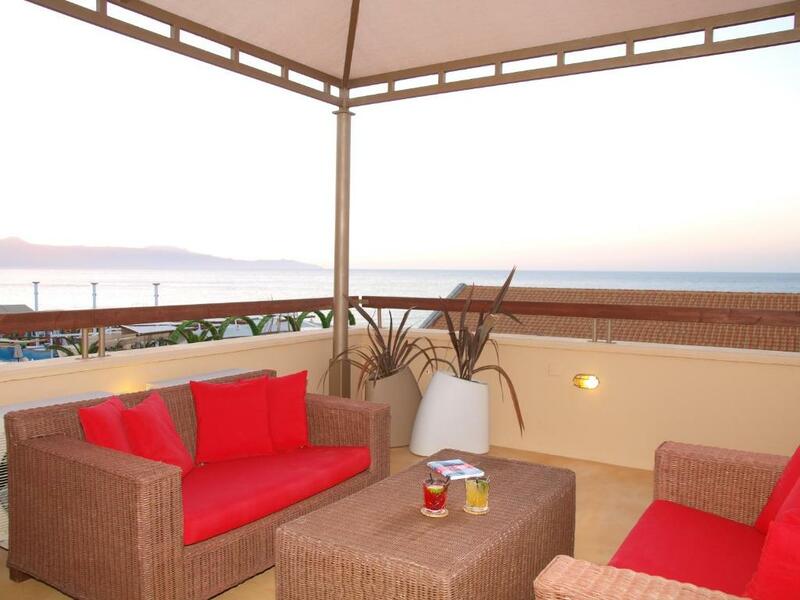 Picturesque Platanias with its many tavernas, traditional shops and nightlife is round the corner. Souda Port is 11 mi away, while Chania Airport is at 16 mi. Right outside the property's entrance, you will find a bus stop and a taxi rank. 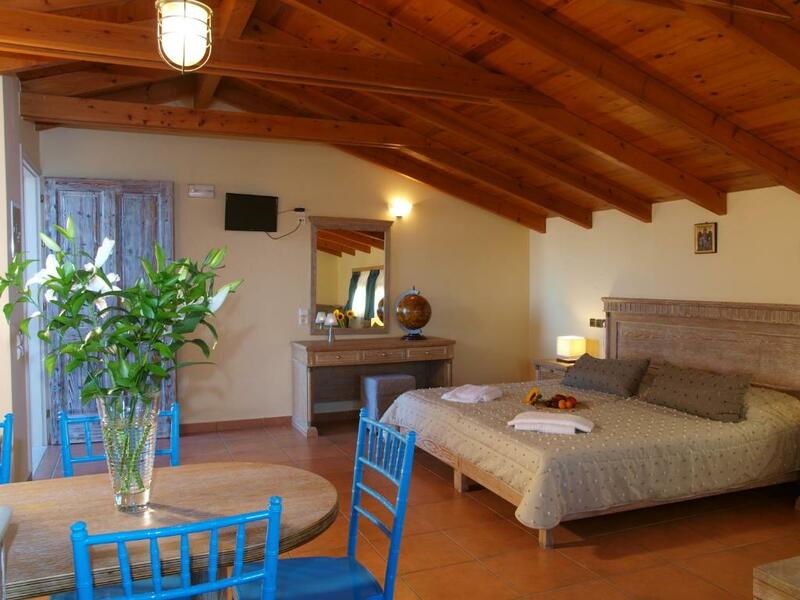 When would you like to stay at Mylos Hotel Apartments (Adult-Only +16 years)? Only 98 feet from the beach, this airy and air-conditioned studio has a seating area and a balcony. The kitchenette comes complete with cooker, fridge and kitchenware. Only 98 feet from the beach, this airy and air-conditioned apartment has a seating area and a balcony. The kitchenette comes complete with cooker, fridge and kitchenware. 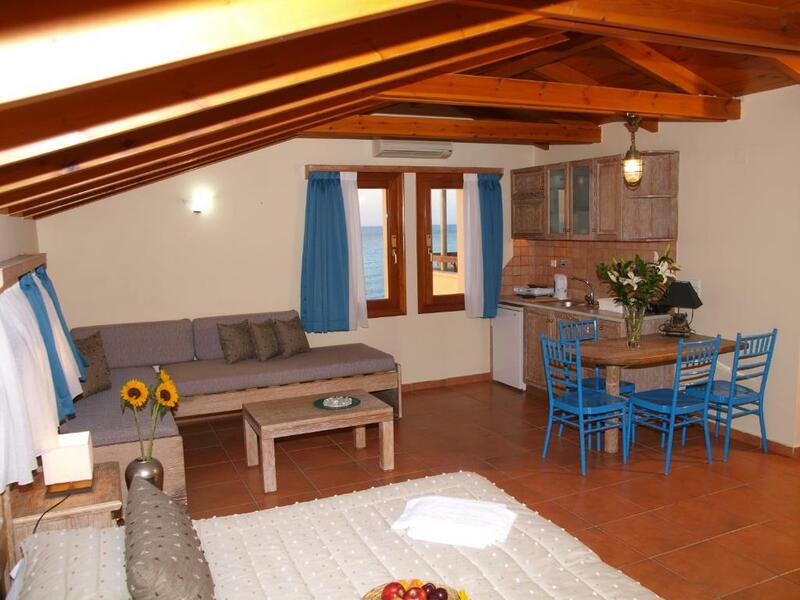 Enjoying views of the Cretan Sea from its balcony, this airy and air-conditioned studio is located on the upper floor and is fitted with beamed ceilings. The kitchenette comes complete with cooker, fridge and kitchenware. Located on the upper floor, this air-conditioned studio features a spacious balcony with partial sea view, a well-equipped kitchenette and seating area. Located on the semi basement, this air-conditioned apartment has a well-equipped kitchenette, a separate bedroom, a seating area and a bathroom with a shower. Please note that this room type does not include a balcony. Το Mylos Hotel Apartments διαθέτει 10 πολυτελή δωμάτια δίπλα στη θάλασσα και έχει τη δυνατότητα να φιλοξενήσει και να ικανοποιήσει πελάτες με καλό γούστο. Δίπλα βρίσκονται δύο από τα πιο γνωστά μαγαζιά των Χανίων το Neromylos Beach & Pool Bar και το Mylos Night Club, που είναι ανοιχτά για όλους τους επισκέπτες τον Ιούνιο, τον Ιούλιο και τον Αύγουστο. House Rules Mylos Hotel Apartments (Adult-Only +16 years) takes special requests – add in the next step! Mylos Hotel Apartments (Adult-Only +16 years) accepts these cards and reserves the right to temporarily hold an amount prior to arrival. Please note that guests arriving after 16:00 must notify the hotel in advance. Please note that free late check-out is possible, subject to availability. Please note that the neighboring swimming pool after 13:00 can be used only by adults. Please note that during July and August, the neighboring Mylos Club is daily open from 00:00 until morning hours and high levels of noise are possible, while during May and June is open only on Fridays and Saturdays and during September and October is closed for the season. Please inform Mylos Hotel Apartments (Adult-Only +16 years) of your expected arrival time in advance. You can use the Special Requests box when booking, or contact the property directly using the contact details in your confirmation. Good beds. Very nice staff !! Good location. Cooking facility could be better but it's good enough for breakfast . Excellent big double bed in a very comfortable room with bathroom and balcony . The only thing we didn`t like was following: - the wifi was only good on the balcony and nowhere else. - When we ate breakfast on the hotelrom and came back there would be ants there trying to bring home some of the bread crumbs back to their places :D but the hotel has a very good cleaner there who allways washed up the dishes and gave us new towells. It was allways clean and comfortable beds. - The hotel doesn`t have a view to the beautifull beach and was very close to a club, but Eva gave us a room that was in the second floor far away from the club, so we didn`t hear anything when sleeping. Loud night club right next to the apartment. Small issue was the WIFI in the room wasn't great, but worked perfectly well the on the balcony. There is air conditioning in the room, but didn't quite manage to totally cool the room and we found ourselves going outside to cool off when getting ready!! But thats 2 girls with hair dryers on full blast! A stunning hotel (current photos do not do it justice), fantastic location, stunning pool, super friendly staff, free beach/pool towels, free access to Mylos Night Club, free access to beach and free access to pool. Lovely hotel close to the beach. Nice room with a lot of space and a big balcony.